So the battle started about 10.30 am after both sides had enjoyed a leisurely breakfast. As a brief aside, Mrs. Brunsom, resident of Broad Chalke, who had lost all her piglets to marauding scavenging reprobates from both sides, remained in a deep perturbation for the rest of the day and was only cheered up by the great bounty of loot she was able to liberate later on. Also by some great chance, the likes of which ripen historical anecdotes, she was able to find her wounded husband, who had been serving in a Royalist Regiment of Foote, and nurse him back to health – albeit without a leg. Picture 10. With great fanfare and clarion the Royalist foote advances, flags fluttering lustily in the breeze. Immediately the Parliamentary artillery commences a tune of its own and a large explosion rips the air as one of their guns blows up showering the C-in-C with gore and startling his horse. Things are looking good, the Royalist commander comments. Picture 11. One the Royalist left wing the cavalry rumbles into a stiff trot to engage the approaching outnumbered enemy horse. 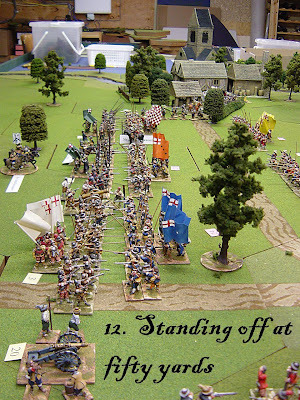 The other half of the Royalist cavalry are invisible on the other side of the village and they too move forward in column due to the space restrictions. Picture 12. 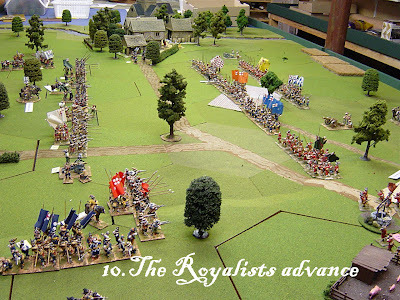 Masking their own guns the Royalist foot reaches the silent Parliamentary lines and stop at 50 yards to exchange fire. Picture 13. 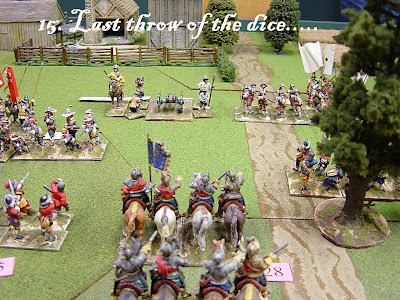 Sir Frank Howard orders them forward telling them not to fire but to close with pikes and then falls dead shot through the breast. With his death and with artillery and muskets peppering their ranks, they hold and exchange volleys and then two regiments rout. 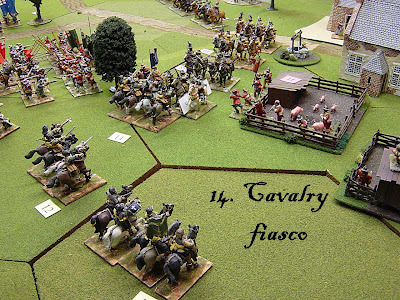 Things look grim for the Royalist foote, as the second line of infantry move into the space led by Sir Kenneth Williams (‘Infamy, Infamy…they’ve all got it in for me’), but can the cavalry win the day? Picture 14. Meanwhile on the left wing the Royalist cavalry attack (divided as it was into two parts by the terrain) fared no better. The first attack resulted in mixed results (somewhat of a curate’s egg) and collapsed due to fatigue. The second attack fell upon fresh Parliamentary cavalry which had been sitting by idly twiddling their thumbs. So much had been expected of the Royalist cavalry and to say they had underperformed would be a slight understatement. 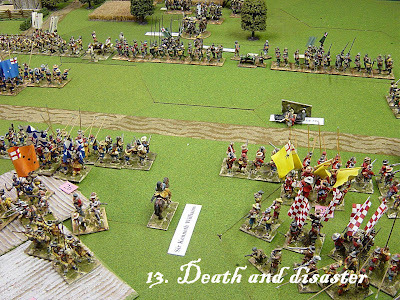 While two out of eight Parliamentary troops had routed, five out of ten Royalist ones were dead or getting the hell out of there. Picture 15. 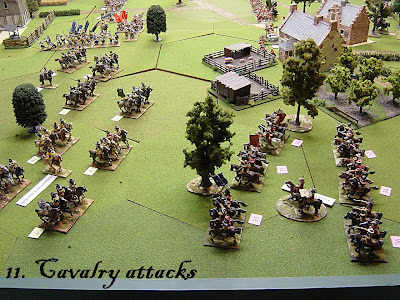 Just before the Royalist C-in-C (me) absented himself from the field (a pressing engagement elsewhere…) he ordered his last two troops of cavalry to charge the enemy line. Their commander, having received the order and seen the C-in-C departing, promptly turned round and departed the field. As he did, he noticed that the Parliamentary dragoons and a regiment of foote had cleared passage of Chipping Snodbury and were beginning to envelope the unprotected Royalist right wing. Casualties were about 300 for Parliament (dead and wounded) and about triple for the poor Royalists who, without Mrs. Brunsom flukiest finding of her wounded husband, would have very little to celebrate. Each month I use the ECW battle reports when they occur on the various blogs out there to generate real time monthly campaign results for my solo ECW campaign. Creat battle report. Lovely figures and scenery.